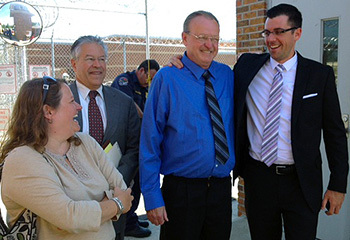 Michael Parker, second from right, is greeted on his release from prison by members of his legal team, from right: Benjamin Glover, Sean Devereux T'69, and Buffy Skolnick, Devereux's assistant. Michael Alan Parker, a client of Duke Law School’s Wrongful Convictions Clinic, has been released from prison after 22 years of incarceration for crimes he did not commit, including allegations of child sexual abuse. At a hearing in Asheville on Aug. 25, Superior Court Judge Marvin Pope overturned Parker’s 1994 conviction — and eight life sentences — and dismissed all charges against him. Parker, 57, was released from Craggy Correctional Center in Asheville on Aug. 26. He is the fifth client of the Wrongful Convictions Clinic to gain release since 2010. Pope’s ruling came in response to a motion for appropriate relief filed in November by the Duke Law clinic and criminal defense attorney Sean Devereux T’69. Wrongful Convictions students, faculty, and alumni have worked with Devereux on the motion for Parker’s release since the summer of 2011. “There is no doubt in my mind that Michael is innocent,” said Devereux, a partner at Devereux & Banzhoff in Asheville, following the hearing. “We are relieved that Michael Parker is out at last and appreciate that it wouldn’t have happened without the dedication and hard work of every person involved,” said Clinical Professor Theresa Newman ’88, who co-directs the Wrongful Convictions Clinic. “We also greatly appreciate Judge Pope’s quick action to correct the injustice and release Michael. After he read the motion we filed, he worked with us and the [Henderson County, N.C.] district attorney to hasten Michael’s release. Parker had nothing but praise for his legal team, thanking Devereux and Newman, and the clinic faculty and students who worked on his behalf. In 1993, Michael Parker, his mother, and seven others, were indicted on multiple counts of child sexual abuse involving his three children, who were living with their mother following the breakup of Parker’s marriage. The allegations, which evolved and changed over time, were shocking and, as the motion for Parker’s release stated, fanciful, involving multiple adults and the trappings of Satanic ritualized abuse. They were made, however, at a time of “near hysteria” regarding child sexual abuse in the United States and elsewhere, said Newman. National attention had been drawn just a year earlier, she recalled, to the Little Rascals Daycare prosecutions which arose in Edenton, N.C., also involved allegations of Satanic ritualistic abuse, and also resulted in wrongful convictions. Among the nine people indicted, Parker was tried first and convicted in early 1994. Several months later, prompted by a desire to avoid her son’s fate, Parker’s 63-year-old mother pled guilty to one count of taking indecent liberties with a child in return for a probationary sentence. About a year after that, a newly elected district attorney dismissed the charges against the remaining defendants on the grounds that there was “insufficient evidence” against them because the children had recanted during Parker’s trial. Yet, as Parker’s lawyers noted in their motion for his release, the children had alleged that at least two perpetrators victimized them at any one time and most allegations were of a larger group; the motion argued that, if the children’s recantations justified dismissing charges against the seven defendants, they also called into question the veracity of the evidence used to convict Parker. Devereux was retained to pursue Parker’s claims of innocence in 1999 and, over time, compiled evidence pointing to a wrongful conviction. This included new medical evidence that discounted the previous medical conclusions in the case, which were based on now-discredited and outdated science, and a sworn recantation from one of Parker’s daughters. Devereux contacted Newman for assistance from the Wrongful Convictions Clinic after learning of its success in securing the release, in July 2010, of another client in Western North Carolina. As a rising 2L working in the clinic in the summer of 2011, Alison Schultz ’13 reviewed and summarized the trial transcripts and medical reports, and began working on the motion for appropriate relief. She worked on the project along with Benjamin Glover, Newman’s son, who was then a rising 2L at Belmont University College of Law in Nashville. Both continued to work as volunteers on the motion until it was filed last November under supervision from Newman and Supervising Attorney Jamie Lau ’09. “The trial transcript alone was mammoth, over 2,500 pages long,” said Glover. “We hunted down quotes in medical reports, cross-referenced facts in the trial transcript, and added citations to the brief.” Glover said it was a privilege to see the expertise Devereux and Newman, in particular, brought to the endeavor. In the fall of 2013, Newman gave clinic students Sitara Witanachchi ’14 and Pate Skene ’14 the task of finalizing the motion. “Pate and I were assigned the task of fine-tuning the arguments, double-checking and, where necessary, correcting the law, and expanding arguments we believed deserved particular prominence,” said Witanachchi, who added that she was thrilled to receive news of Parker’s release. “We held many meetings with Professor Newman to strategize on how to ultimately present the most persuasive and efficient legal document to ensure Michael Parker’s release. Devereux observed that Parker may be the last individual to have been imprisoned on a conviction relating to Satanic ritual abuse. “This case arose in a particular historical context,” he said. “We are not arguing that child abuse doesn’t occur,” said Newman. “It does, and it is a heinous and devastating crime. But I think everyone would agree that the consequences of an unchecked, false accusation by a child are also profound. It is harmful to the child’s long-term well-being, devastating to the individual falsely accused, and detrimental to the victims of actual instances of abuse. Apart from her satisfaction with securing Parker’s “long overdue” release, Newman is gratified by the expertise in wrongful convictions litigation that is reflected in her students’ work on the case. Clinic co-director James Coleman Jr., the John S. Bradway Professor of the Practice of Law, agrees. “We are all very pleased that the Wrongful Convictions Clinic could join Sean Devereux in his effort to gain Mr. Parker’s freedom, and that he recognized the special expertise we have developed in drafting motions for appropriate relief and getting them filed,” said Coleman. The Wrongful Convictions Clinic has eight more motions for appropriate relief pending in court on behalf of clients and numerous investigations ongoing.